MAX GAIN 9000® is gainer to increase muscle mass, which contains no fat. Added only high quality whey protein and the best amino acid to increase muscle mass - L-Glutamine. 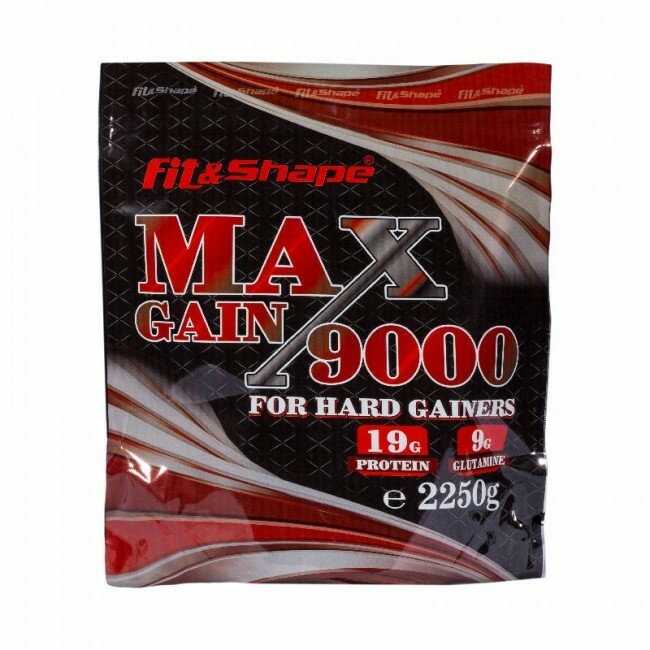 MAX GAIN 9000® gainer is to increase muscle mass, which contains no fat. Added only high quality whey protein and the best amino acid to increase muscle mass - L-Glutamine. Each serving delivers 19 grams from 125 grams Protein and objectives 9000mg L-Glutamine for faster recovery after exercise. Rich taste with natural ingredients. DIRECTIONS OF USE:: Suitable for reception by people with a fast metabolism. Its high content of glutamine will ensure rapid muscle growth and proper recovery after exercise. INGREDIENTS: Maltodextrin, dextrose, whey protein concentrate (milk), l-glutamine, emulsifier: carboxymethyl cellulose, flavorings, colorings: vanilla (none); banana, melon, peach, Tropical (minimum fruit content 2%) (beta carotene); cookies with cream, chocolate cake, coconut chocolate, Irish cream, hazelnut cream (cocoa powder); strawberries, berries with yogurt, raspberry, cherry (minimum fruit content 2%) (carmine), sweetener: sucralose, acidity regulator: citric acid.